5 Genius Byron Bay Camping Tips! 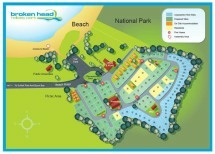 You are here:Home » Blog » Camping Tips & Tricks » 5 Genius Byron Bay Camping Tips! Experienced campers know all the usual hints and tips for Byron Bay Camping. But even the most stalwart campers can learn from one another. Below are some tips that are uniquely different and can make your camping trip more comfortable and efficient. We’ve all seen the colourful floor tiles that fit into one another and are used in children’s bedrooms or playrooms. Take a few of these along and use the tiles to floor your tent. Apart from providing a more comfortable night’s sleep, the foam will absorb moisture and condensation that accumulates in the tent while you sleep. Lighting up the dark is essential for every camping experience. As an alternative to an electric lantern, you can take your head lamp and attach it to a soda or water bottle with the light shining inward. The light will refract through the water, providing a warm halo of light at your Byron Bay camping site. Take a plastic coffee can and cut a slit down one side, insert your toilet roll with the edge of the paper protruding from the slit and Voila! You have a damp-free loo roll holder for your Byron Bay Camping trip. You can also attach string to the coffee can to act as a handle. Instead of using traditional ice packs to keep your cooler box or bag cold, freeze water in 2 litre or gallon jugs instead. Although these bottles may take up more space in the cooler, they will remain frozen for longer keeping your perishable goods fresh. Alternatively, fill resealable bags or vacuum seal packs with liquid dishwashing detergent and freeze them. They take up less space and can be frozen to conform to corners or fit into tight spaces. Ever been camping and go to open a can of food and realise you left the can opener behind? Don’t feel embarrassed, even the most experienced campers can forget to pack everything that they will need for their Byron Bay camping trips. Have a camping checklist on hand so that you can ensure that nothing essential is left behind. The list will also ensure you don’t leave any of your gear at the campsite. You can download and print great camping lists from the internet. If you have any other Byron Bay camping tips that our campers can use, just let us know by sending us an email. We look forward to receiving your thoughts and advice.